This is an ambitious debut that delivers. In a multi-generational saga of beauty and heartbreak, Halan Alyan deftly shows us the love and sorrows of one Palestinian family as they attempt to find their place in the world as exiles. As each character searches for a sense of home in an increasingly stressful world, family bonds are forged and broken, relationships developed, and the very idea of nationality questioned. Written with lyricism and sympathy, this side of the conflict is rarely shown but impacts us all. Much like Khaled Hosseni's novels about Afghanistan, Hala Alyan crafts an exquisite novel about Palestine, perpetual exodus, and the trauma that lives within family trees. Salt Houses does what literature does best: create radical empathy. A book as gorgeous as the cover. On the eve of her daughter Alia’s wedding, Salma reads the girl’s future in a cup of coffee dregs. She sees an unsettled life for Alia and her children; she also sees travel, and luck. While she chooses to keep her predictions to herself that day, they will all soon come to pass when the family is uprooted in the wake of the Six-Day War of 1967. Salma is forced to leave her home in Nablus; Alia’s brother gets pulled into a politically militarized world he can’t escape; and Alia and her gentle-spirited husband move to Kuwait City, where they reluctantly build a life with their three children. When Saddam Hussein invades Kuwait in 1990, Alia and her family once again lose their home, their land, and their story as they know it, scattering to Beirut, Paris, Boston, and beyond. Soon Alia’s children begin families of their own, once again navigating the burdens (and blessings) of assimilation in foreign cities. Lyrical and heartbreaking, Salt Houses is a remarkable debut novel that challenges and humanizes an age-old conflict we might think we understand—one that asks us to confront that most devastating of all truths: you can’t go home again. HALA ALYAN is an award-winning Palestinian American poet and clinical psychologist whose work has appeared in numerous journals including the Missouri Review, Prairie Schooner, and Colorado Review. She lives in New York. "[Salt Houses] illustrate[s] the inherited longing and sense of dislocation passed like a baton from mother to daughter." "What does home mean when you no longer have a house – or a homeland? This beautiful novel traces one Palestinian family's struggle with that question and how it can haunt generations. Hala Alyan's own family history – for years, she felt as if she belonged nowhere – clearly informed her book, but her professional life as a clinical psychologist who has worked with refugee clients plays a part too. Along with another favorite from this year – Mohsin Hamid's Exit West – this is an example of how fiction is often the best filter for the real world around us." 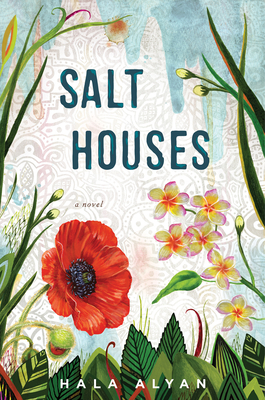 "Read Salt Houses...In Hala Alyan's novel about a Palestinian family in the aftermath of the Six-Day War, children rebel and return and the matriarch's memories fade with age, fraying the brood's ties to their homeland. In the process, the book reveals the inner lives of people too often lumped together in the service of politics." "Alyan explores the human agency in the face of the harshest realities without compromising the complex nature of the Palestinian diaspora. This is a heart-wrenching, intimate look at the intergenerational impact of losing a homeland." "Gorgeous and sprawling...In many ways, Salt Houses is about the displacement of millions in war-ravaged lands. But more precisely, it's about the significance of 'home'— what it means to make a home, to lose it, and to go home again when nothing looks or feels the same...Heart-wrenching, lyrical and timely, Salt Houses is a humanizing examination of a family torn apart and remade by conflicts both too complex to grasp fully and too personal to not recognize in ourselves, wherever we might call home." "What happens when displacement enters your DNA? This is the questions that Alyan's brilliant debut novel both poses and answers, and—to borrow a heavily used phrase—it feels like one we particularly need to be asking ourselves right now...[Alyan is] an extraordinarily gifted novelist...[Salt Houses is] an epic in every sense of the word...[It] shines in its intimate details; notably, in the ways in which no character is allowed to be a stereotype, and in the way it grapples with those all too human-scaled experiences of alienation and belonging, displacement and rebuilding. Alyan might be grappling with universal problems like war and brutality, but since she renders them through the perspective of one family, through their personal triumphs and struggles, she keeps these issues on a recognizable scale." "Each new chapter of Salt Houses shifts perspective and jumps in time...These perspectives touch back on each other through small details, fashioning a collective, familial history. One character’s revelations illuminate the life of another...Alyan’s talent is immediately apparent in her exquisitely detailed scenes and the complex ways her characters relate to one another...Alyan is also a poet, and the last pages of Salt Houses drop like the end of a poem—they crush the reader while also lifting her up...Narratives like this one complicate and humanize America’s simplistic view of Arab cultures, toppling the flimsy idea that Arab people are intractably Other." —Bustle, “15 New Authors You’re Going To Be Obsessed With This Year"